Members – for your information. 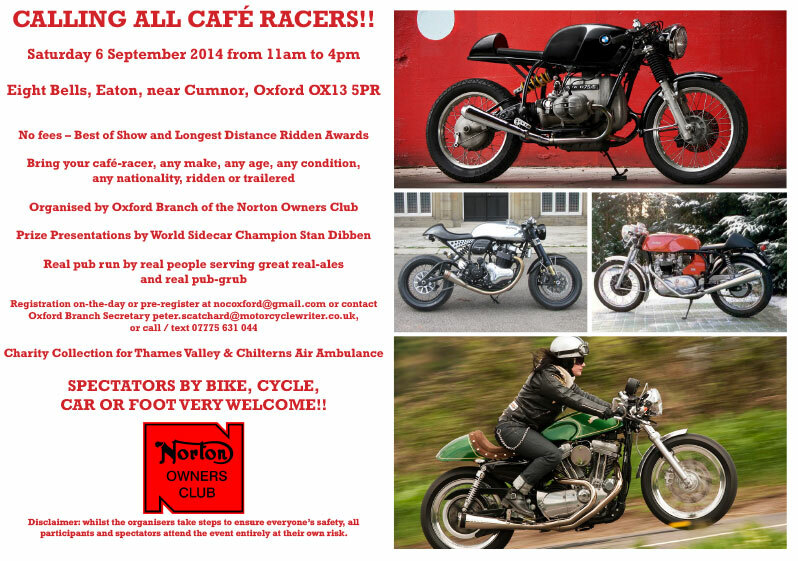 Cafe Racer Day 2014 will be organised by the Oxford branch of the Norton Owners Club and is (now) being held at The Vine in Cumnor. Everyone is invited to come along to this very enjoyable event and if you have a “cafe racer” styled machine then so much the better. Last year approximately 75 cafe racers turned up as well as a wide variety of other bikes British and non British, including Bob P on his Velo Thruxton. The event is very informal but prizes will be given for Best Cafe racer etc. The images below give some idea of the variety of machines that turned up. Good beer, friendly natives and probably a tasty hog roast add to the occasion.